MIKE WILLIAMS IS global accounts manager, drilling & measurements, Schlumberger. DC: What arenas will be the key areas of focus for the industry in 2010? Williams: If you look at the major finds that the industry has had over the last year, they are nearly all deepwater. There is no doubt deepwater has boomed and will continue to boom. If you look at the major deepwater plays in the world, the Gulf of Mexico and Brazil are both growing. The same is true to a lesser extent in West Africa. For us, deepwater is one of the major focus areas, together with extended-reach drilling (ERD). They share similarities in that they are both at the extreme of drilling activity today, and despite the downturn, both areas have kept pace. This has to do with the up-front investments companies have made in drilling wells like these. You are looking at a year-plus lead time to plan these operations, so obviously companies have invested a lot of money before they even start to drill. The benefits of running geosteering types of LWD to put wells in the best production spot may not be immediately visible but should become apparent over the well’s life. The big prize is in deepwater because it is unexplored. ERD is similar except that we’re much more interested in how we access the reserves. The benefit of ERD is that we can put in a rig remotely from the area we are trying to access, 10 kilometers or more, which is beneficial from both an environmental point of view as well as a cost standpoint. DC: What are some of the major challenges you face in these areas? Williams: The overriding issue is how to make and apply cost-effective technologies that will help our clients drill wells efficiently, regardless of market conditions. We are looking for more creative ways to increase our penetration rates, reduce downtime and optimize drilling without incurring problems or issues. The big challenge comes with the technologies that have a huge benefit, but the immediate cost-vs-benefit equation is not so obvious. This applies to logging-while-drilling (LWD), where the benefits of running corrective geosteering types of LWD to put a well in the right place to maximize production are not immediately seen. That cost-vs-benefit equation is not seen in the well budget well by well. It is in the production we get down the line. In deepwater and ERD, the challenge is about directional control, how we reach the target and put the well in the optimum place to increase production. In deepwater, we have to get information from downhole back to the surface in wells that are 30,000-plus feet long and growing all the time. We also have the concern of very high pressures and the large, cold mud column that exists because of the extreme water depths. In ERD, some challenges are the same, and some are almost the opposite. The measured depths are similar so the challenge of high-speed data transmission is the same. But because the reservoirs are shallow and the footage drilled is more lateral, it means well construction is at very shallow depths and in soft formations. This means the majority of the well is at a high angle, which increases the directional complexity. Another challenge involves people, especially since the level of expertise the industry demands is different than it was 20 years ago. There is no doubt that the so-called “Big Crew Change” is still coming. So how do we make the best use of our very experienced people on multiple rigs? How do we retain the right people through upturns and downturns? In downturns, the people who leave the industry usually find employment elsewhere and don’t return. DC: What new and evolving technologies have been proven in meeting these challenges? Williams: In terms of telemetry, there are two areas where we are seeing advances. For traditional mud-pulse telemetry, we have a platform called Orion II, which, in conjunction with our LWD system, dramatically increases the data rates we get from downhole. This massively impacts deepwater drilling and ERD because we are transmitting data such a long distance. Also, the data rate itself increases. We have also invested in a joint venture with National Oilwell Varco to use wired drill pipe for data transmission. This removes the potential block in the bandwidth to where data rates are as quick as the modems we use today. Instead of transmitting data through mud, we are transmitting it through a wire. This technology is still in its infancy, but the potential for it is huge because we’re removing the bottleneck on data flow, which will ultimately allow us to make smarter decisions. Another evolving technology is beginning to be advanced through our Operation Support Centers (OSC), which number 47 worldwide and provide monitoring, quality control and intervention services. We are embarking on a project to take the OSCs to the next level by locating our people remotely to control or manage multiple wells and rigs from those sites. The mission is to prove to our clients that this function can provide good-enough connectivity and good-enough control remotely to where they have the confidence that our people don’t need to be next to the rig site. DC: What technologies do you see emerging in the next 12 to 18 months that will move the industry forward? Williams: In the near term, a lot of the advancements will come in the form of expansions of existing technologies. And the technologies we develop and expand for deepwater and ERD are applicable to almost all of the offshore market. The industry has used LWD to use the data gathered while we drill to proactively place the wellbore in the right place to maximize production. But we have been limited by how far we can see from the wellbore. In the past, we had to cross a boundary or formation to see what and where something was from the wellbore. In recent years, we have developed technology to see 20-feet plus out from the wellbore without crossing boundaries or formations. There is now a huge market to expand that technology further to see maybe 100 feet. If we do this, we can start to put that data on a traditional seismic map, and the two ends of the scale start to meet each other: the seismic reading we took pre-drilling and the data we get while we are drilling. Extended-reach drilling has gained traction by enabling operators to position rig costs effectively. It is also particularly suited to drilling where environmentally sensitive locations prevent the building of drill pads. If we can integrate and interpret those two together, we can truly put the well in the best possible place for production. We also will see an expansion of rotary steerable capabilities. Although rotary steerables currently represent 40% to 50% of what we drill as a company, there are still limitations, particularly in the dogleg. We’re heavily looking into how we can increase the dogleg capability and consistency to expand the envelope of wells. It is in its infancy now, but in the next one to two years, I foresee that expansion taking hold. I also believe we will see advances in formation sampling, so we’re not just taking a pressure reading but actually bringing samples back to the surface. DC: What technology gaps exist today in deepwater and ERD drilling? Williams: In high-pressure and/or high-temperature environments, often deepwater, there are limits today in what can be done in terms of directional and logging tools. If we look at high pressure, the industry today is regularly requesting tool systems that are capable of dealing with 30,000 psi, but that’s not enough. I think there is going to be a strong push for drilling tools and systems that go to 40,000 psi and beyond, which will require a new design. 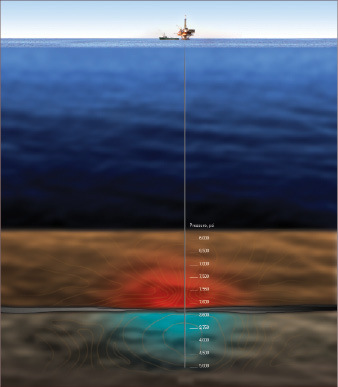 Some recently drilled deepwater plays are not quite to 40,000 psi, but they are pushing the existing technology right to the edge. I think the industry is struggling with what HT really is. Typically, in our part of the industry, we would call HT anything between 150° and 175° Centigrade, although there are some wells over 200°C that need to be drilled. We do not have the equipment to do that today. Again, this is not a small adaptation. We are talking about building a new tool that will allow us to put an extreme HT well in the right place. The issue is, how many of these wells can we drill and can the volume of those wells justify the investment? I think one of the biggest gaps is how we take the high-tech advances in deepwater drilling and ERD and adapt them to be cost-effective in the lower-tier markets, particularly shale plays and high-volume environments. Some of the technology is applicable, some is not. I am sure there is some well placement technology that has not been developed yet that would be specifically applicable to shale and other unconventional plays. The real key is that the whole industry needs to move in the same direction. Some parts of the industry are ahead of others right now. Developing drilling tools that can drill these wells without having the completion technologies, like sand control, is meaningless. All the technology pieces have to fit together.